I am a Biochemical Pharmacologist trained at the University of Zimbabwe (BSc) and at the Karolinska Institute, Sweden (PhD). After a 2 year postdoctoral fellowship at Uppsala University (Sweden) I worked for 10 years at AstraZeneca, Sweden, as a Principal Scientist in Pharmacokinetics and Bioanalytics. With the help of industry and international organizations, I founded the African Institute of Biomedical Science and Technology (AiBST) with the aim of promoting the sciences and technologies of drug discovery and development in Africa. I am currently the President and Chief Scientific Officer of AiBST. I have over 75 original publications in peer reviewed journals, 5 book chapters and co-edited a book on Drug Discovery in Africa. I have conducted pioneering work in predictive pharmacokinetics and pharmacogenetics in preclinical and clinical drug discovery research, contributions which have been recognized through various awards, memberships to various international organizations, expert consultancy to companies & organization such as WHO, and invitations to make keynote presentations at international meetings. I have a passion for training postgraduates and have trained 10 PhD students and several masters students to completion. I believe that innovative hybridization of industrial and academic approaches has a chance to jumpstart biomedical developments in Africa. Over 20 years experience in genetics, genomics, bioanalytical chemistry and drug discovery & development research. Published over 80 original research papers in international peer reviewed journals, 5 book chapters and co-edited a book on Drug Discovery & Development in Africa published by Springer. A Principal Scientist at AstraZeneca Pharmaceutical Company (1998-2007) and founding President and Chief Scientific Officer of the African Institute of Biomedical Science and Technology (2002 -2007 part time, 2007-now full time). 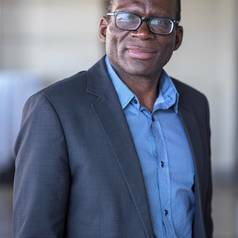 Honorary Professor of Clinical Pharmacology at the University of Cape Town (South Africa), Visiting Lecturer at the University of Nairobi and Part-time Lecturer at the University of Zimbabwe. Consultant Scientist for three major international Pharmaceutical companies. 	Genomic Medicine Research in HIV, TB, Malaria, Schistosomiasis, Cancer, and Cardiovascular Disease.